These earrings are made from pure silver precious metal clay (PMC). I have fallen in love with PMC the possibilities are endless! PMC is reclaimed silver from silver nitrate in old films. Ground into a clay binder it can then be worked like porcelain clay. So suits my recycling criteria perfectly. After shaping, carving or stamping, it is left to dry, then sanded and cleaned up before firing. 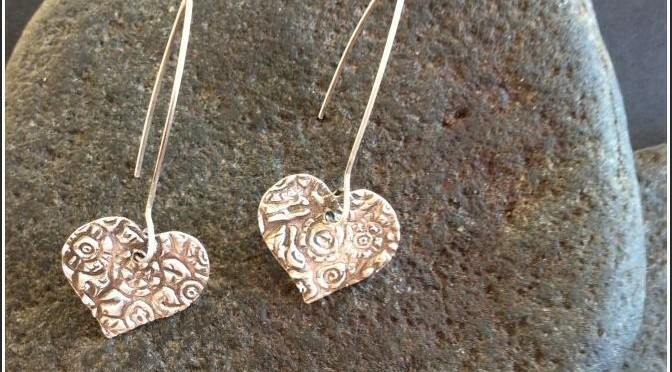 Firing burns off the clay binder and we are left with pure silver. 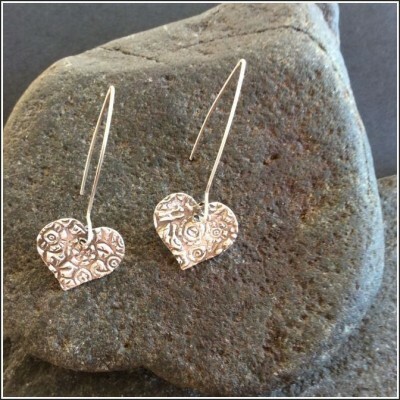 The floral heart earrings are attached to sterling silver earwires which is a bit more robust than pure silver. I add patina, and polish to get the gorgeous pattern more defined.